As most of you know, we have the Saturday morning Donut ritual in our house. 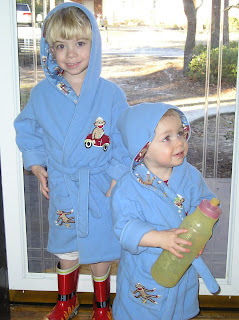 Shannon and Sam wake up, throw on their robes, sweatshirts, slippers and/or rain boots and head for Dunkin' Donuts. It's actually quite a social event. The drive-thru line serves as the perfect place to hob-nob with other local donut getters that we know from various circuits (school, church, neighbors, bunco, etc.). This time, Fulton demanded to be a part of the action. They suited up in their drive-thru attire and completed another successful mission. We invite you all to meet us in the line on Saturdays!!! The coffee is well worth the trip! We were packing up Sam and Fulton to go to Nana's & Papa's for the night a couple of weeks ago. Sam has a clear bag that he totes his Monster Trucks in. Little Fulton was so disgruntled because he wanted to tote some in a bag too. I found this little clear bag and we put some of Sam's not-so-favorite trucks in it and voila...He was happy as a clam. 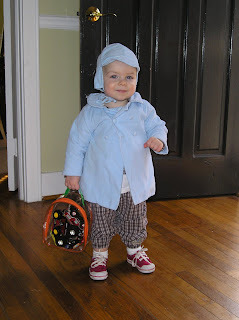 I love this picture...He looks so proud of his very own bag. Clear bag-$1.99... Monster Trucks-$3.99... A night out with your husband- $100.00... The look of pride on your child's face-Priceless!